Just when we thought we've seen everything there is to be seen from Chanel (weddings, rodeos, supermarkets, etc. ), Karl Lagerfeld once again worked his magic and managed to surprise us all. Leave it to the King to turn the Grand Palais into an even more stunning setting, like, say, an entire Parisian street. Complete with trompe l'oeil apartment buildings, sidewalks, and even glittering puddles in the "street," the runway became Boulevard Chanel and the supermodels, including Cara, Kendall, and Gisele, became fashionable, feminist protesters ready to take the city by storm. 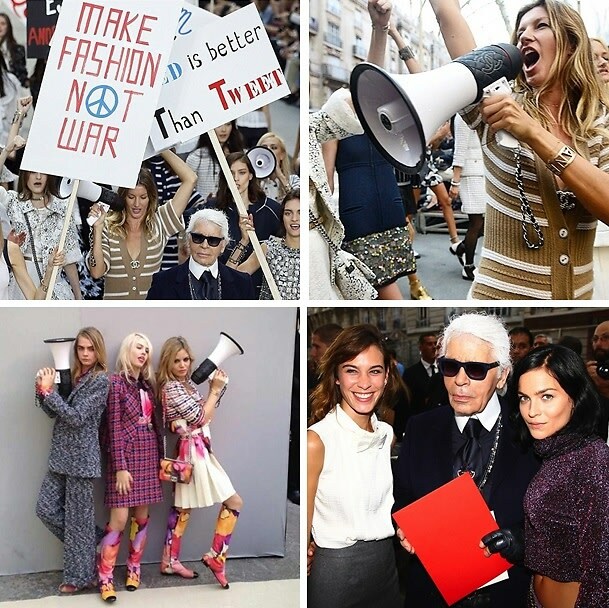 Holding signs that read "Make Fashion Not War," "Ladies First," and "Divorce For Everyone," models marched down in a grand finale that was just as colorful as the Spring/Summer 2015 collection they were donning. Click through for a full look at the Paris Fashion Week show EVERYONE will be talking about.